Following his win in the Giro d'Italia Tom Dumoulin has also added the BinckBank Tour 2017 to his palmares after surviving the final stage. "It's great I can still keep up with the best on this type of course", the Dutchman said. 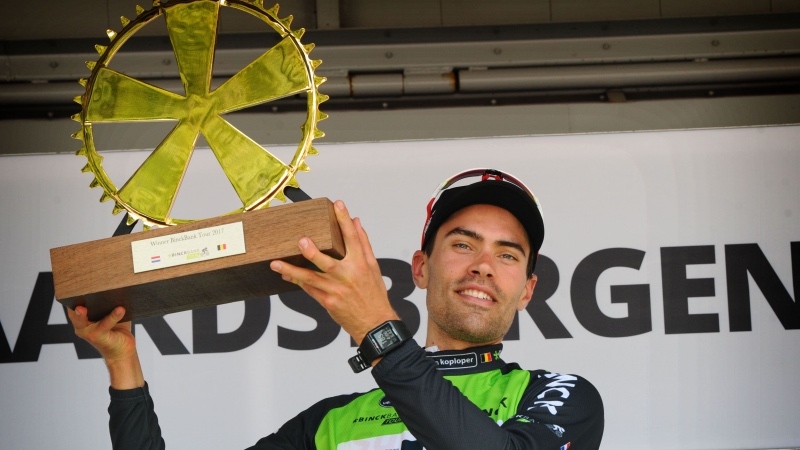 Dumoulin started the final stage from Essen to Geraardsbergen with a slender four-second lead on Tim Wellens. The team leader of Team Sunweb increased that lead to 17 seconds with bonification seconds in the Golden Kilometre and at the finish. "At the start of the stage my legs still felt tired but in the final I managed to push through it," Dumoulin commented after the race. "After an earlier attack I was too far back but fortunately Sören Kragh Andersen was around to close the gap. The past week we've shown as a team that we're very strong. I am proud of the job the guys did here." Despite hanging onto a very small lead Dumoulin never lost his cool. "Four seconds is not a lot," the 26-year-old admitted. "A few years ago I would have been very nervous but thanks to my experience I can handle it a lot better now. I knew in advance your lead will come under attack but I kept very calm." For Dumoulin the BinckBank Tour is the second stage race he has won in 2017 after his win in the Giro d'Italia. "The Giro was a very nice victory," he added. "After a couple of bad experiences where I threw away a win in the final stage, I finally did it. The BinckBank Tour win underlines my versatility as a rider. I started out as a rider suited to these kinds of races but the last couple of years I grew towards being a climber. Despite the fact that I'm two kilograms lighter than in the Giro, I am still handling the cobblestones very well. That's a pleasant observation to make." Dumoulin thinks his versatility also has other benefits. "I get to compete in different types of races and that keeps me fresh and ambitious," the Dutchman explained. "I can have my cake and eat it too. So far it's going well, although I'm coming up a little short in the one day classics. In the future I want to take another step so I can be in a position to win those races." Click "Accept" to indicate your agreement .